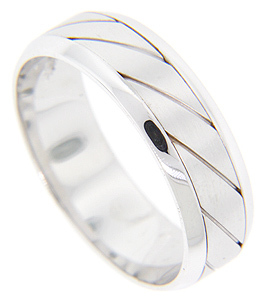 Diagonal lines create parallelograms around the circumference of this 14K white gold modern men’s wedding band. The center of the ring has a slightly matte finish while the edges are polished to a shine. The band measures 7.2mm in width. Size: 12. Cannot be re-sized but we can reorder in any size. The ring can also be purchased in white gold, yellow gold, platinum or palladium. Contact us for current market cost.